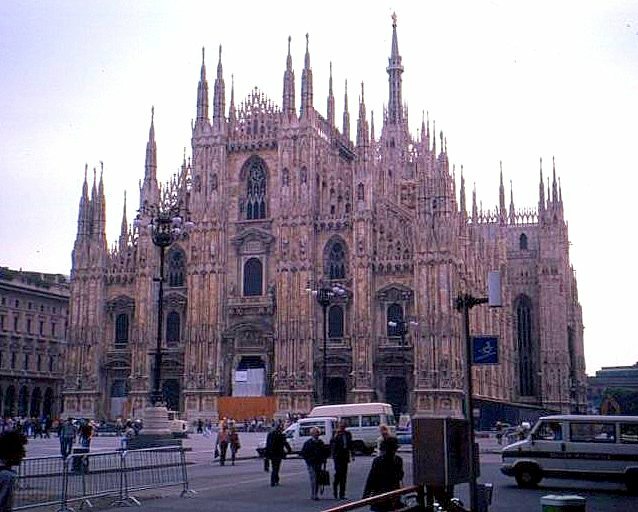 Front facade of the Duomo, Milano, Italy. 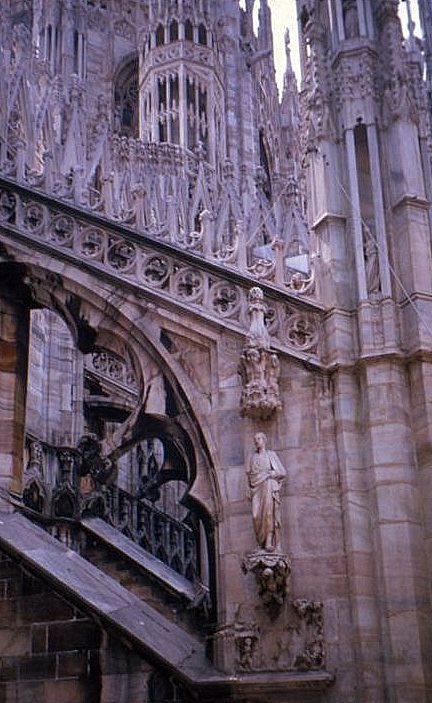 The Milan Cathedral (Duomo di Milano) is the city’s cathedral and the home church of its archbishop. Duomo capped by the “Madonnina’s spire, Milano, Italy. This cathedral took nearly six centuries to complete. 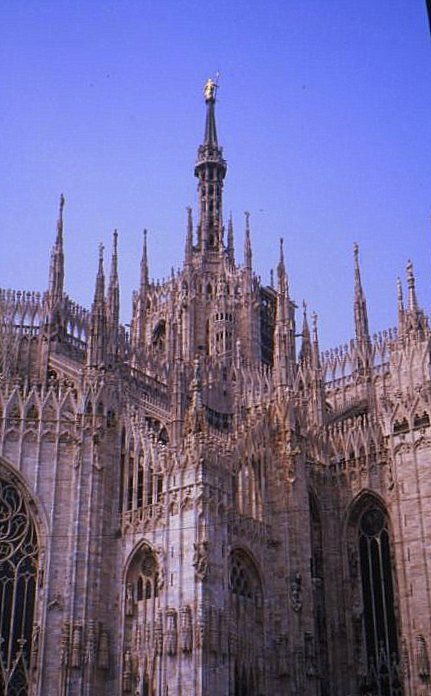 It is Italy’s largest, Europe’s third largest, and the world’ 5th-largest church. 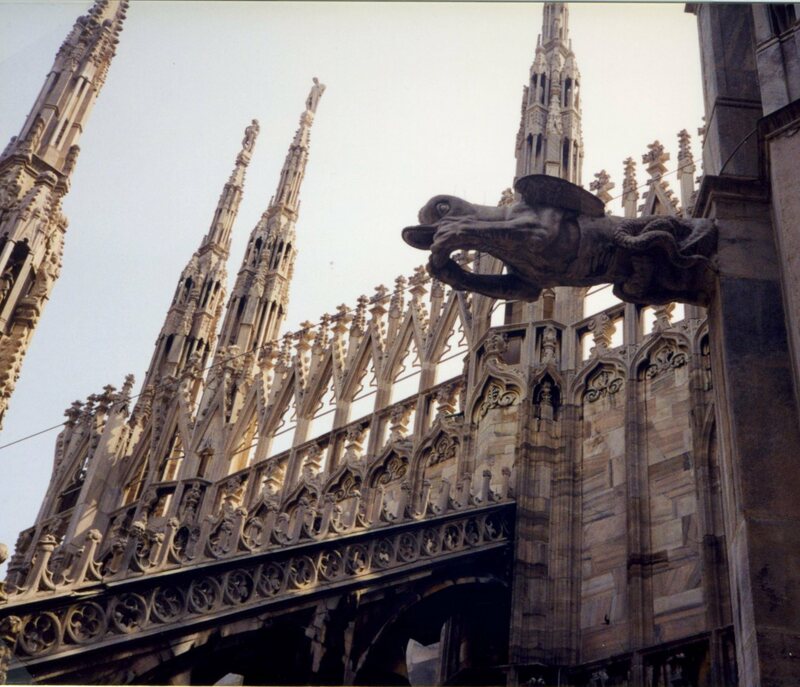 Gothic spire detail, Duomo, Milano. Italy. 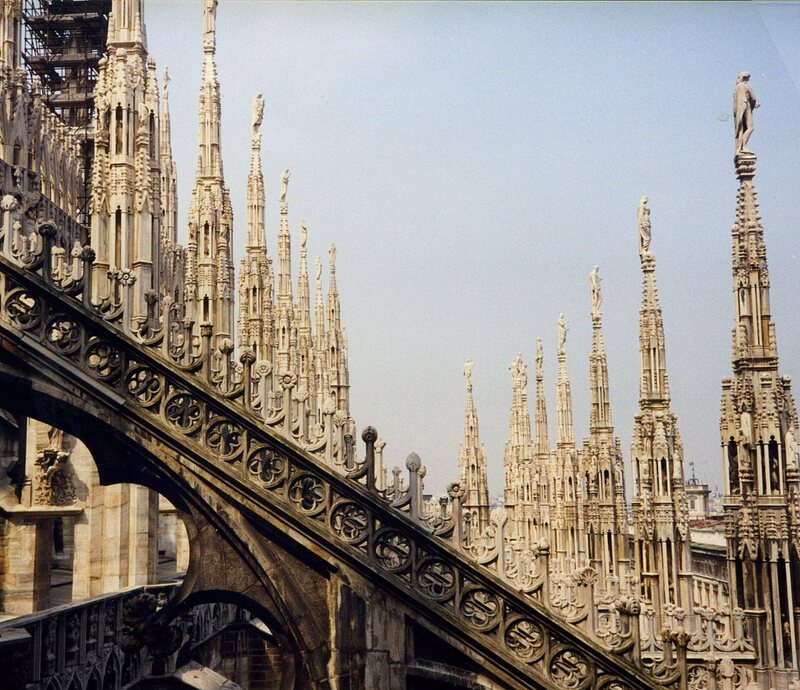 The Duomo occupies what was the center of the ancient Roman city, but its construction did not begin until 1386. 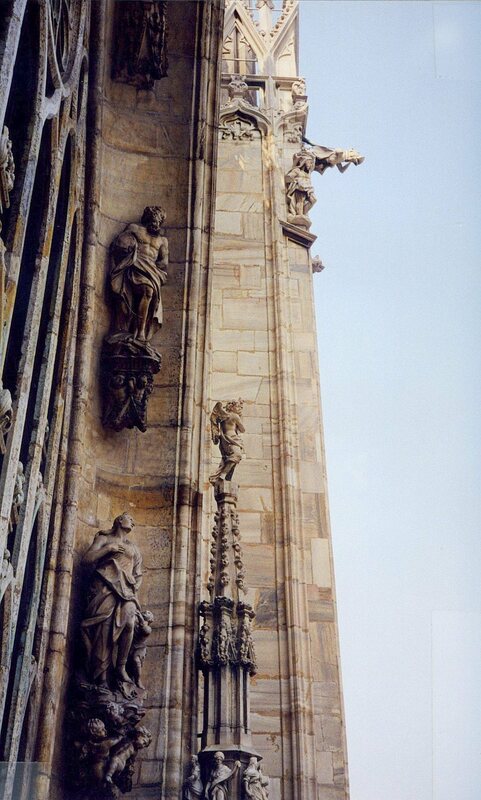 Facade detail, Duomo, Milano. Italy. The signature “Madonnina’s spire”, which rises to more than 300 feet, was not erected until nearly 400 years after construction was begun. Given Milan’s damp and foggy climate, the Milanese consider it a fair-weather day when the Madonnina is not obscured by mist. The Duomo’s facade was not added until its completion was ordered by Napoleon Bonaparte, who was crowned King of Italy there. The last details of the cathedral were finished only in 1965. 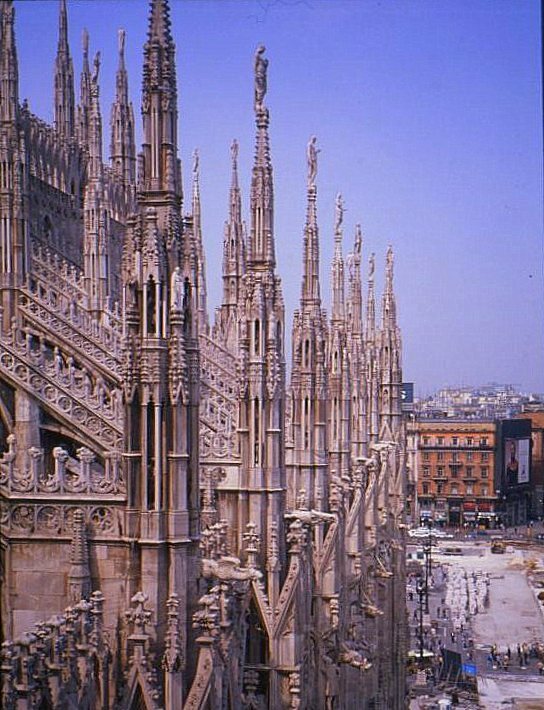 Many Milanese, reminded by the centuries needed to complete the Duomo, use the term “Fabbrica del Duomo” – built like the Duomo – as an adjective to describe an extremely long, complex task. 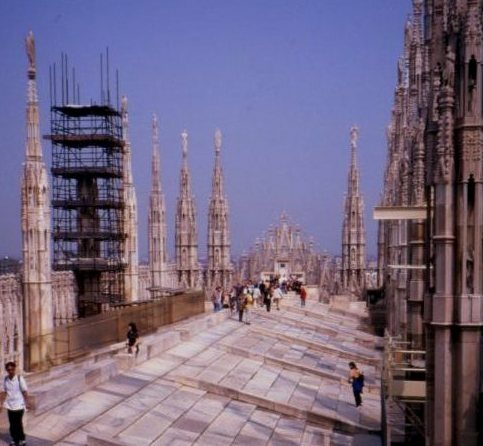 The Duomo’s rooftop is open to the public, and is reached by an elevator. Rooftop deck, Duomo, Milano. Italy. Architectural detail invisible from the street below suddenly becomes full sized, and statues, gargoyles, and spires tower over roofwalkers. 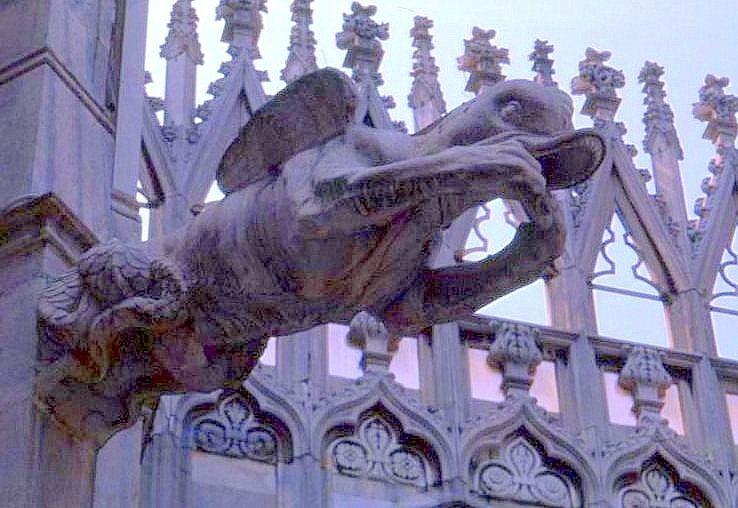 The effect of pollution on the Duomo requires diligent maintenance, and officials recently announced a campaign to raise funds for its preservation that asks patrons to adopt the building’s gargoyles. Rooftop view of the city, Duomo, Milano. Italy. 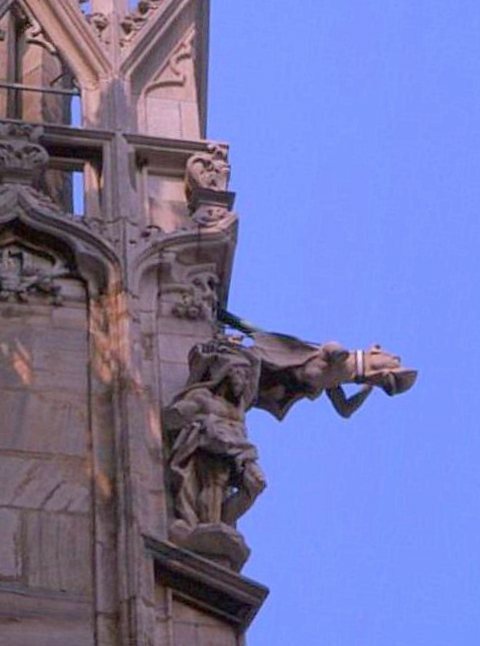 Donors who contribute €100,000 or more can now have their name engraved under one of the grotesque figures perched on the cathedral’s rooftop. 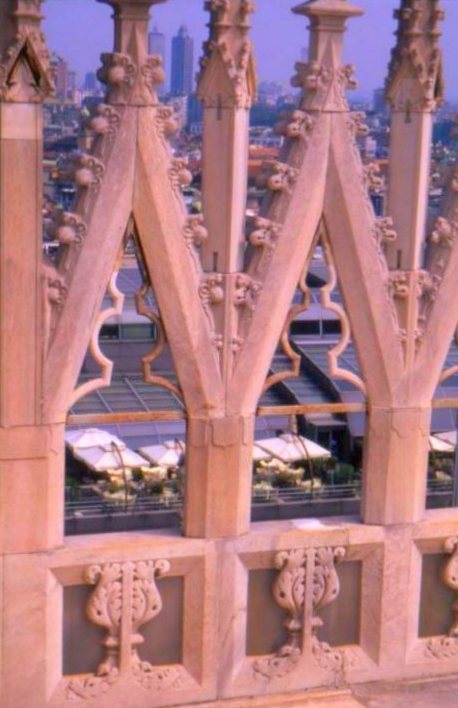 Downtown skyscrapers visible through stone lattice work, Duomo rooftop, Milano, Italy. There can be a stiff breeze up here, and from this vantage point the skyscrapers of modern Milano tower in the distance. On a clear day, the Alps are visible on the horizon. Spires seen from the rooftop, Duomo, Milano. Italy. As I walk the rooftop, I can’t help but be reminded that the weight of this building rests on columns and arches made of interlocking stones without any structural steel. It seems a gravity-defying feat. Entrance to the Galleria, from the Dumo rooftop. And for anyone who’s been here, the fondest wish is that there will always be a next time.